This food blog was started over a year ago, partly just for fun and partly because I discovered that Barrie was without a food blogger or restaurant reviewer of any kind. It has been a service and a hobby, but never a business. Shawna Bailey, a local virtual assistant, messaged me recently with her ideas about gaining revenue through blogging. She was also interested in my someday dream of perhaps organizing a ghost walk and dinner event in downtown Barrie. Shawna suggested we meet for lunch to talk and the Lazy Tulip, a fave of hers, was chosen. I have been hoping to try the Lazy Tulip for quite a while. At its 29 Maple St. location, just south of Dunlop St., it is almost next door to my workplace. I quickly tidied myself up from my own cooking shift, changed clothes and skipped over to the Lazy Tulip while hoping I would recognize my lunch date. We only had social media profile pics to go by! No need to worry, I spotted Shawna right away. We were seated at a small table at the far right wall, near the fireplace. It was the perfect spot for taking in the surroundings and people watching. Oh hello - there's Randy Aywin, owner of the Grilled Cheese Social Eatery! If other local restaurant owners like the LT, it must be good. I love the chalkboard message below the front counter. "A tulip doesn't strive to impress, it doesn't struggle to be different from a rose. It doesn't have to. It is different. There is room in the garden for all flowers." 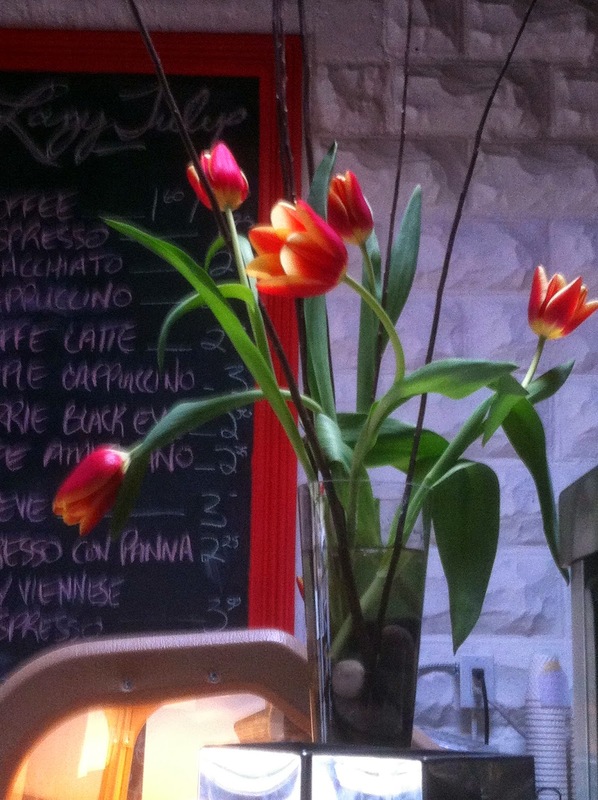 I liked the decor - a mix and match of old and modern, a palette of black, white and splashy tulip red. The white painted stone/brick north wall is especially cool and looks to be the exterior wall of an adjacent building. Shawna and I chatted a lot right off the bat, and sipped ice cold minted water. Some days, the water jug includes sliced lemon or watermelon instead of fresh herbs, she tells me. I forgot to look at the menu, with all my gabbing, but Shawna already knew what she wanted. She is stuck in a happy rut and looks forward to her meetings at the Tulip so that she can order the free range chicken and brie panini with caramelized onions and cranberry-red pepper jelly. When I finally got my act together, I ordered the Thai tofu wrap with a rustic tomato soup to start. The soup was very nice. The fresh homemadeness was apparent - flavourful and full of bits of real tomato. The wrap was a work of art on a plate. Beautifully presented and boldly colourful with carrot, tomato, sprouts and organic mixed greens. The tofu is organic too and marinated in soy sauce. (I must try this.) I would also love to know the exact ingredients to that wicked thai peanut sauce that totally made that delightful wrap! The other great thing about the Thai wrap? The crunch! That crunch says fresh to me. Neat little place with a conciousness about healthy people and a healthy planet. Eat vegetarian, gluten free, organic, free range, fair trade and local at the Lazy Tulip in what their website aptly describes as "a quaint and funky setting". No taste has been sacrificed in the name of healthy living. You will be surprised at how good the good tastes. Thanks for showing me, Shawna!